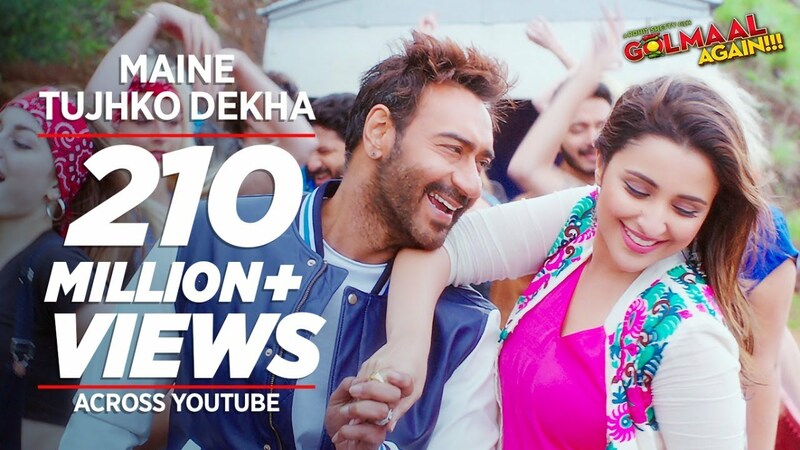 After its trailer, the second song from Golmaal Again is out, titled Maine Tujhko Dekha, the song is a recreated version of Neendh Churayi Meri, In this Golmaal Again Song, Ajay tries to woo Parineeti on “Neend Churayi Meri”. Presenting the video song "Maine Tujhko Dekha" of the upcoming Bollywood movie Golmaal Again, Starring Ajay Devgn, Parineeti Chopra, Arshad Warsi, Tusshar Kapoor, Shreyas Talpade, Kunal Kemmu And Tabu.Reliance Entertainment presents In association with Mangl Murti Films Rohit Shetty Pictures "Golmaal Again" Produced, Directed and Story by Rohit Shetty. ♪ Song Programmed by - Abhijit Vaghani & Sourav Roy. ♪ Additional Programming - Rahul Pandirkar & Riz Shain. ♪ Vocal Conductor - Krish Trivedi. ♪ Mixed & Mastered by - Eric Pillai at Future Sound Of Bombay. ♪ Acoustic & Electric Guitars Performed By - Ankur Mukherjee. ♪ Music Assistants - Krish Trivedi, Shishir Samant, Zaiyd Patni, Yash Narvekar, Ankush Bhardwaj, Vivek Bharti, Gaurav Sanghvi, Anvay Patil, Rujul Deolikar. ♪ Production Manager - Jyothi Malik. 'Neend Churai' song Licensed from Sony Music India, originally composed by Anu Malik & Penned by Rahat Indori.